We hear a lot from the men’s rights movement about the type women who receive alimony. What we don’t hear from them is, alimony is only received if it’s deserved. Bill’s face turned red as he read the letter from the judge. Their divorce was contentious, and he knew it was a gamble letting the judge decide how to settle the marital assets. His ex and he just couldn’t agree. She was irrationally demanding that he pay alimony, and he wasn’t going to budge. No way was his hard-earned money going to support her lazy, entitled lifestyle. He earned plenty of money as a doctor, so he could afford to pay her a monthly allowance, but it was the principal of the matter that he disagreed with. She didn’t do anything all day long, why doesn’t she just get a job? The judge’s letter spelled out he would be paying $8,000/month to his wife in alimony, for 10 years. His eyes widened and mouth clenched as he read and reread that number. Could he handle the payment? Yes! But he may need therapy to get through it. It’s therapeutic to laugh about alimony, but it’s very serious if you’re dealing with it for the first time. Stories like the above can be funny to some, horrifying to others, but they create a stereotype of alimony that says: only gold digging, [email protected]$$, lazy, entitled women get alimony because they make irrational demands on their hardworking ex-husbands. Let’s debunk a few myths about alimony. What’s the difference between spousal support, alimony, and maintenance? They are all the same thing. 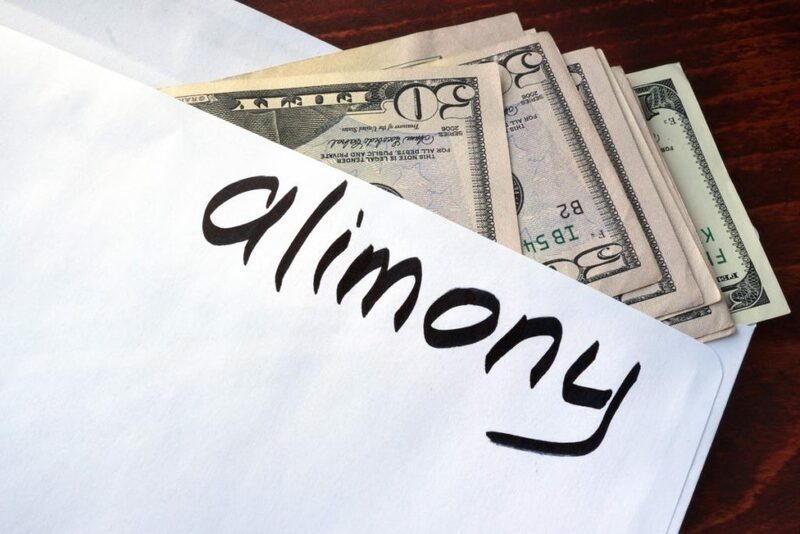 The term “alimony” is gradually becoming replaced with “spousal support” and “maintenance”, probably because of the stereotype associated with the term “alimony”. What are the chances of me getting alimony? Slim. Alimony is not very common. It takes a perfect recipe of incomes, jobs, family history, age, health, and standard of life to make alimony a good fit for a divorcing couple. Your divorce can’t be finalized yet. You can retroactively be awarded spousal support. If you are currently in the divorce process, you can look at being awarded alimony in two ways. One, negotiate it into the property settlement agreement. If you and/or your attorney are getting stuck in negotiations trying to incorporate it into the agreement, contact a divorce financial analyst. We are trained to help come up with a solution that will work for both parties. Two, let the judge decide. The judge may award alimony based on the case your attorney makes in court, but they may not. You roll the dice when you let your divorce fate be decided on by a judge. A general rule is that spousal support will last for half the length of a less than 10 years long marriage. However, in longer marriages, the court will not set alimony duration. The burden will be on the party who pays to prove that spousal support is not necessary at some future point in time. In my home state, however, there is no state guideline. So, a judge uses his or her discretion to determine if and how much alimony should be awarded. What does a judge look at when deciding the spousal support amount and duration? How long you were married? Are both you and your ex-spouse physically/mentally able to work? Are you healthy? Is your spouse healthy? How old are you and your spouse? Can your spouse afford to pay spousal support? What’s the current job and life situation for both you and your spouse? What was your prior standard of living? What are your reasonable needs? Is your spouse responsible for supporting others besides you? Would awarding alimony even out the property settlement for your divorce? How do I determine my “reasonable needs”? I don’t want to change my quality of life. This is a gray area. You can debate it in negotiations, or you can roll the dice and let the judge decide what you reasonable needs are. In the case of red-faced Bill, above, the judge determined that his wife had reasonable needs to partially sustain her formal standard of living. It won’t support the vacation home and travel that she was accustomed to, but she can continue to live close to her old standard of life, with a few adjustments. Why did the judge award that much in alimony to her? Bill and she had been married for 30 years. She was a stay at home mom for 30 years. Her kids are grown now, but she was out of the workforce for so long, she doesn’t feel her chances are good at starting over at an entry-level job. That’s hard to do at 55, she says. The judge awarded her $8,000/month for 10 years, and $150,000 from their retirement accounts. She’ll either have to invest wisely or get a job and save up more for retirement in order to support herself in retirement after the alimony runs out in 10 years. Who pays the taxes on spousal support? The person who receives the spousal support will usually pay ordinary income taxes on it. The person who pays the spousal support can deduct it from his or her taxes. There are a couple of exceptions that disqualify the taxation of spousal support. If you are questioning whether it should be taxable in your case, contact a divorce financial analyst. Do men receive spousal support? You bet. I know several successful female doctors (they can be of any profession) the key here is that they consistently make a high income) where their husband is a stay-at-home dad. He may have a part-time job, but he is the primary caretaker of the kids and the home. If they get hit by divorce, those men will likely be looking at receiving “maintenance” payments from their ex-wives. Is alimony a good fit for me? Or is there a better alternative? Alimony is not my favorite. It has significant weaknesses, which I will address in another article in the future. There are alternatives to alimony which are much more beneficial. But each divorce is unique, and alimony may be the only or the best solution. Send me a message if you need alimony alternative help before I get that next article published. This is what most people think of when they hear the word “alimony”. It represents the loathsome, greedy, shallow, diva side of humankind. Maybe that’s true in some cases. But most likely, not. On the other side of the alimony story is probably a hurt, pain, and loss. So next time you hear of someone having to pay alimony, think twice before you start imagining red horns growing out of the ex-wives head, holding her hand out for more money. There’s two sides to every story, including why alimony was awarded. After 30 years marriage; much evidence to my support of him in a wide range of ways, I received 40% of his yearly compensation, but he was very agreeable based on his guilt. He’s older than his new wife/cheating partner by 17 years. She’s was recently surprised when my attorney went after her when my ex was out of work (which happened numerous times in our marriage due to his inappropriate behavior.) My divorce judgement read “any income”…… so KARMA. I work, will never be able to retire as he left me with $100K of debt, but I do enjoy seeing her deposits into my account monthly.